A complete edition of his works appeared at Hof in 1884-1887. The monument is on the edge of Art Hill next to the path running north and south along the western edge of Post-Dispatch lake. He studied theology and philology from 1796 to 1802 at Halle Göttingen at the University of Greifswald. He is commonly known as Turnvater Jahn roughly meaning "father of gymnastics" Jahn. 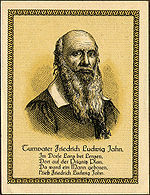 Friedrich Ludwig Jahn (August 11 1778 – October 15 1852) was a German gymnastics educator and nationalist.